Domestic tourists should carry 2 photographs and 2 photocopies of id proof. In case of international tourists, please carry 5 photographs and 5 photocopy of your passport & visa. In rural area there is no possibility to print copy of your documents. Do not carry heavy luggage while travelling. It burns your energy and takes the fun away. Man Can wear Shirts or T shirts and pants or shorts. Dress conservatively. Females can wear pants or skirts reaching below the knee. No sleeveless tops. Avoid indecent exposure of your attire. Ideal dressing is the Indian attire (Chudidar for females and Dhoti Kurta for males). Villagers will respect you if you accept their customs. Alcohol consumption is strictly prohibited in Gujarat. The best way to distress is by involving into various activities in the itinerary. Do not use abusive language or play loud music. By doing this you will only loose respect and get divided from the locals. Talk to your local coordinator who will accompany you in all activities in case of any discomfort. In case you are curious to try something please do so but with permission of your coordinator only. Avoid leaving plastics in the rooms while departing. You can avoid this by carrying less plastic while boarding. You can buy package bottled water at just Rs 15 to Rs 20. Always carry one water bottle along with you. Be prepared to face the hot weather during summers however the nights are pleasant. Monsoon and winter are the most pleasant seasons. Luxury of Air Conditioner is not available except in case of any AC Taxi. Fresh Organic Vegetarian meal will be served in breakfast, lunch and dinner. In case of test preference please update in advance. Normally the tribal food is spicy so instruct your coordinator for your taste preference. In case tourist is not bringing own car or a rented taxi, service for inter village shared taxi is available. This will be in a Geep that halts at all villages on the way to pickup and drop the passengers. Tourist will have to pay to such taxi drivers in cash. To have a comfortable sitting you may pay double to rent between villages so that you get more space while travelling. In case you come by rented or owned car with a Taxi Driver. The price of meals and any consumable should be paid either by the tourist or taxi driver based on mutual understanding. Carry your personal toiletries, towel, toilet paper, sun screen lotion, etc. In case you prefer hot shower please ask for hot water. Laundry service is not available. We conserve water. Carry desired medicines. In case of any allergy, please inform the coordinator to take care of your stay. Be prepared of poor mobile network in some locations. It is good to get disconnected sometimes! Carry torch, umbrella, trekking shoes, sleepers and most important of all – Camera to capture one in a life time moments. Rs 2999 per person including taxes. 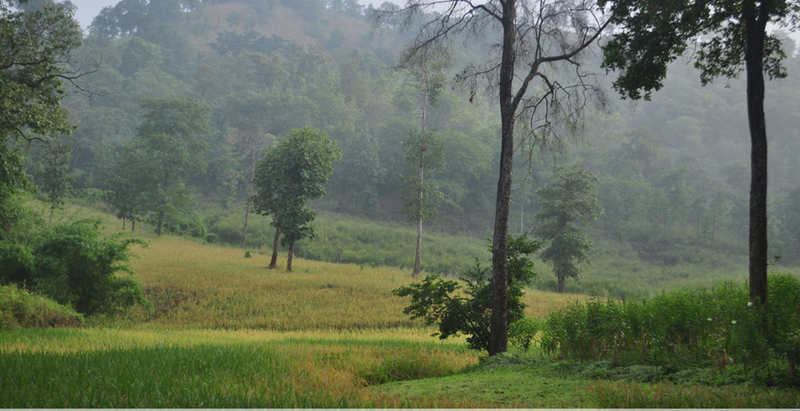 At Dangs 90% of the area is covered under forest. Hence it is the perfect habitat for wild life and insects.